I have not forgotten writing you. I was just having too much fun in the East Coast, mixing work and play. James and I were away a total of ten days. First we presented workshops at a church; then we reunited with my brother and sister, and their spouses. We also visited James' sister and brother-in-law one evening. We are grateful for a chance to serve and interacted with so many special people in the Greater New York area. We arrived home late Saturday night. The next day after church, we went to San Francisco to celebrate Mother's Day with James' mom, sister, brother and their families. How wonderful it is to enjoy time with both sides of the family in May! At age 95, James' mom has many children, grandchildren and great-grandchildren. 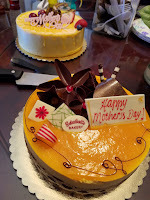 We celebrated with yummy Chinese food, cakes and beautiful flowers. Mama was very happy. On Monday, James and I took her to the park and walked around the lake. I went brisk walking while they strolled with her walker. 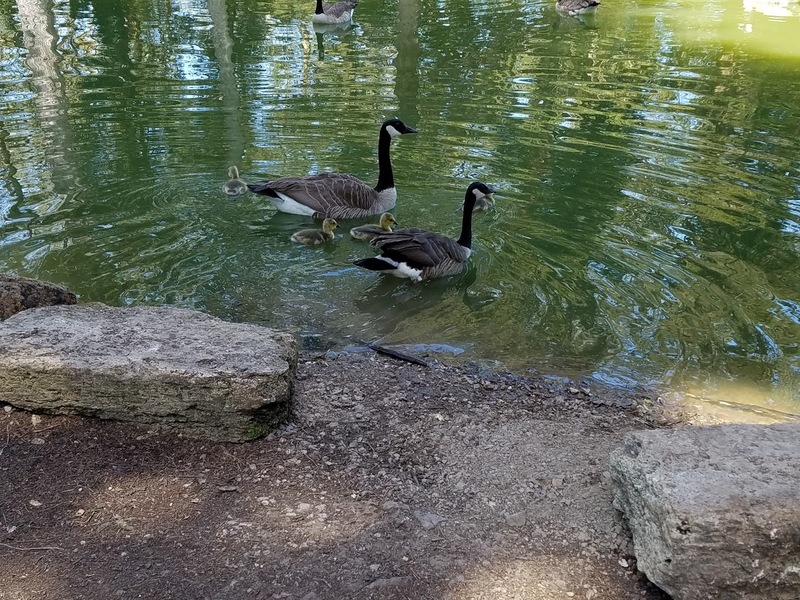 We reunited just in time to see a pair of Canadian geese taking care of their little ones. Obviously the mom and dad were protective and watchful while training their little ones. Finally they went for a swim. Those goslings will grow up and fly away. And that is good! As we were celebrating Mother's Day with James' mom, our son and his family Skyped us. I'm grateful for technology. But even if there was no Internet, physical distance really does not have to break heart-to-heart connections. I love the card our son sent me. As a mother and grandmother, I was so encouraged by his note. The photos of him, his wife and their kids are precious. Oh how fast the kids have grown! I remembered how James took our young son to Yeye and Nainai on the weekends, and how our adult son walked around the lake with me when he visited the Bay Area. As I am writing now, my heart is filled with love, gratitude and contentment. Jesus Christ my Savior can also transform your life, marriage and family. Even though I still missed my mom who passed away in 1975, I am grateful for my family and the body of Christ. Although I still feel sad that my mom never met my husband and son, I can now sit with that sadness and experience joy. What great things our Lord has done! Enjoy people you love. Happy Mother's Day!